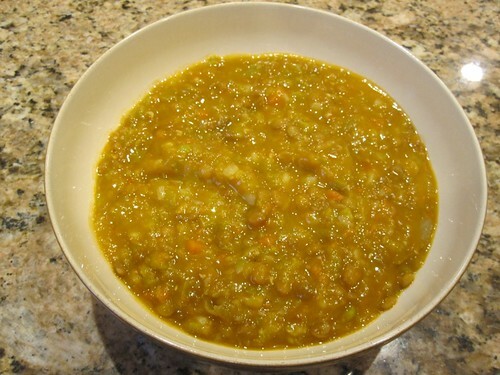 Rinse lentils and split peas well then add to boiling water and simmer until done, about 40 minutes keep checking water make sure the waster doesn’t go below the beans and peas. Heat olive oil in large pot, saute onions and garlic over medium heat until onions are clear about 5 minutes. Add celery, carrots and 1 cup of water, simmer until al dente. add cooked lentils and split peas that have been drained. add tomatoes and plus the juice, to pot. Add v8 juice, salt, pepper, and basil to pot. Bring to a boil reduce heat to simmer. Add potatoes and simmer until potatoes are done about 30 minutes, stirring at least every 10 minutes. Wow!,,,, sounds delicious!!!!! Thanks for posting the recipe…. no idea why the time is off, very strange.